Burundian forces arrested the leader of a failed coup yesterday and president Pierre Nkurunziza returned to the capital, his spokesman said, but protesters pledged to go back to the streets, setting the stage for more clashes. Maj Gen Godefroid Niyombare was captured two days after announcing Mr Nkurunziza had been toppled in the African nation, which is still recovering from an ethnically fuelled civil war a decade ago. “He has been arrested. He didn’t surrender,” presidential spokesman Gervais Abayeho said, after earlier announcing three other generals had been detained. Burundi was plunged into deep crisis after Mr Nkurunziza announced he was running for another five-year term. Opponents say this violates the constitution and a deal to end the civil war that pitted rebel groups of the majority Hutu population, including one led by Mr Nkurunziza, against the army which was then commanded by minority Tutsis. The army is now mixed and has absorbed rival factions, but the coup attempt exposed divisions. Diplomats say the longer unrest continues, the more chance that a conflict, which up until now has been largely a struggle for power, reopens ethnic wounds. The unrest worries a region with a history of ethnic killing, but there was little sign tensions were easing. 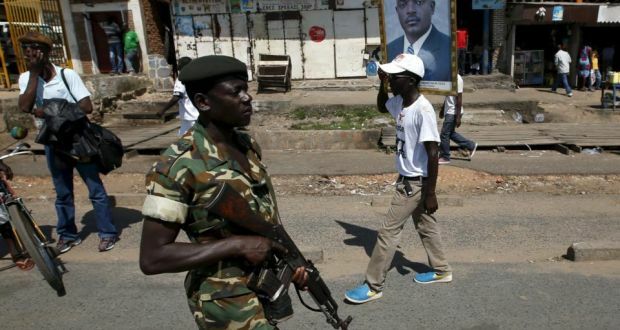 Troops loyal to Mr Nkurunziza had largely calmed the streets after frequent gunfire on Thursday. But activists called for more rallies against the president, while some Bujumbura residents said police told them they would be fired at if they did demonstrate. Until the coup attempt, protests had been almost daily. Protesters hurled rocks while police fired tear gas, water cannon and even fired at the protesters. More than 105,000 have already fled to neighbouring states, including Rwanda, with the same ethnic mix as Burundi. Rwanda was torn apart by a genocide in 1994 that killed 800,000 mostly Tutsis and moderate Hutus. Hundreds lined the streets carrying flags for the president’s return from his rural home. His spokesman said he was back in the presidential palace after returning to Burundi on Thursday from Tanzania. A man with a head wound lay dead in a street in Butarere, a Bujumbura district and hotbed for protests. Residents said police had shot him and wounded two others. A group of men in Bujumbura’s Cibitoke suburb said they had been told by police they would be treated as rebels and shot at if they demonstrated. Even before the coup attempt, officials had called protests an “insurrection”. The heavy-handed response of the police to demonstrations has drawn stern rebukes from western donors, who have urged the president not to run again. The EU, Belgium and the Netherlands have suspended some aid, particularly that linked to elections.